The MBIO16 adds 16 digital I/O points to your SPLat controller. 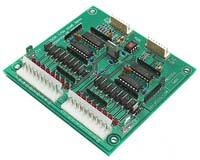 It is easy to use, appearing simply as another 16 inputs and 16 outputs. You can use each point as one or the other. The ouputs are capable of sinking up to 2A at 24V, making it ideal for driving heavy duty solenoid valves and small motors. No explicit initialization is required. As outputs the MBIO bidirectional I/O points use a solid state power MOSFET switch between the pin and ground (0V). The load (say a solenoid coil) has to be connected between the output pin and the positive supply voltage. The maximum allowable output current is up to 1.5A steady state, with brief (5S) peaks of 2A allowed. There are onboard catch diodes, so it is safe driving inductive, non-motor loads up to the rated current. For motors the locked rotor current must be within the output rating. See the documentation for more detail. As inputs the MBIO bidirectional I/O points provide industry standard NPN compatibility. Tying the input pin to ground (0V) registers as an On (True/logic 1) state. Leaving it open circuit or driving it to the positive supply voltage registers and an Off (false/logic 0). See the documentation for more detail. Developers' kit, contains the expansion board with 16BIO (high current FET outputs), 600mm shielded cable, matching connectors and mounting standoffs.